The reason for the deadlock is a new procedure announced in August last year by the Excise department through the Commissioner, making the documentation procedure of the supply chain from the distributor with the L1F license to the off-trade and on-trade online in an effort to make it transparent and efficient for wine and spirits with effect from February 15, 2013. This would also include using the bar codes on each bottle making it possible to check out where any wine bottle was from- and which distributor legally sold the bottle. As is usual with every new procedure adding to the complexities and the costs, there was resistance by the trade hoping it would not be adhered to and scrapped. Come February 15 and the department stopped issuing new transfer permits unless the request was made online with advance payment of duties by the outlet purchasing wine. It became mandatory for the distributor and the buyer to install the hardware including scanners and barcode reading machines with the necessary software, costing appx. Rs.106,000 to Rs. 150,000. Importers, Distributors and the outlets have not been ready for the change, hoping there would be an extension which has however been refused by an upset Commissioner. Many importers complain that the hardware and software are not available despite their having made the payment. TCS has developed the software and hardware is recommended to be purchased from Motorola or Honeywell. There are no restrictions but the department would not entertain any complaints in case of problems emanating from other vendors. As on date some importers including Brindco, Hema, Pernod Ricard and Sula are known to have the systems installed while a few including Ace Beverages and Mohan Bros say they have made the payment but the system has not been installed yet. But the bigger problem is hundreds of retail outlets which are also required to install the hardware. Many of them were prudent enough to have stocked their wines for the next couple of months. April is always uncertain due to the annual renewal license policy. Some of them are sitting on the sidelines as they feel the policy might be scrapped altogether (the incumbent Commissioner who is keen to implement the procedure, is reportedly due to retire in April). Unless they too install the equipment, the supply chain cannot be completed. 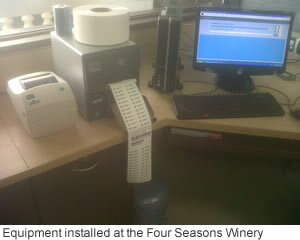 Each bottle has to be scanned before putting in the stores of the excise license holder or at the delivery point. This is of course time consuming for the buyer too but imagine the plight of the vendor if 3-4 land up at the same time to deliver and the time wasted on waiting. Perhaps, the times would need to be coordinated. With scanned documents going back and forth-Bill of Entries, TP requests etc must be scanned and sent online, the 3-year old server is overloaded and needs an upgrade. Reportedly there were five server crashes lasting about 4 hours each time during the last month, according to a distributor. The department also needs to install faster servers with bigger capacities, they feel. The excise duty has now to be deposited by the buyer directly and online. Strangely, so far the distributor was being arm-twisted to bear the duties before supplying the material to off-trade and on trade. The total sales including taxes was on credit basis, ranging from 30 days to indefinite (there are plenty of black sheep who don’t pay up, according to the importer-distributors who are at a loss now. Even in an odd case where the distributor might want to pay the excise duty on behalf of a good customer, it has to be routed through the buyer and that creates another accounting headache. And what happens in case of bad paymasters? There is no provision for the distributor to refuse the buyer the material under the proposed policy whereas in a natural marketing environment, the supplier is at will to refuse delivery unless the previous payments are in order. As a business strategy, some distributors don’t like to share their stock figures with any outside agency. Since now they would be forced to upload the figures online, their stock figures would be made public, at least on the computers from where the resourceful competitors would be able to get the figures, making smaller distributors very uncomfortable and insecure. There are a couple of cases of the distributor being under distress and possibly being unable to renew his excise license during the coming year 2013-14 from April onwards. He is being obliged to shell out Rs.150,000-200,000 now on the equipment and software which would become useless for him in a month. This seems rather unethical and dictatorial on the part of the department. One of the rather weak reasons forwarded by some of the importers is that since the system is complicated and there is need to understand and master the software it would require a lot of time to train such staff at the buyer’s end and in case of him quitting there would be gaps. However, this problem would need to be addressed like any other business problem as one goes along. One of the significant factors in favour of computerizing the whole process must be to plug in the leakage of excise duties. A very fair expectation, all agree. The two basic known reasons in Delhi are diversion of stocks sold to the embassies or meant for the embassies under an allotted quota. The second is the entry of material through the neighbouring states-especially Gurgaon, the bordering city which has lower and more rational policies and is thus thriving because of cheaper wines. There are no known cases of open smuggling as one hears about in certain parts in South India where different rules apply unofficially. The importers and distributors argue that this step is not going to solve either of these problems. However, this is the prerogative of the government and one has to support their policies however cumbersome they may be in this respect. One can only plead for them to be pragmatic. The problem is more in the spirits industry than wine because of the spurious liquor. The joke about more Black Label selling in India than being produced in Scotland is still doing the cocktail circuit. The current step would be a boon for the consumers and until the bootleggers device a new strategy, the consumers would be much happier with this system as they would have the traceability. Online operations are the key to efficient operations in any business today and nobody can create a hurdle in the process; all the importers and distributors agree in private. Rome was not built in a day, though. They all feel that the step taken by the excise department is irrefutable but it ought to have been done in steps- computerizing in different lots, taking steps and not strides. With their arbitrariness and high handedness, turning a deaf ear to the genuine problems has resulted in an avoidable impasse. The business is suffering and this is the time of the year when the sales are at the maximum. The new policy has been designed to bring into the net all the sales of wine, beer (in this case only cases would be scanned reportedly) and liquor and includes Indian products too. The only exception that has been made is that whatever stocks were already available duty paid on 15th February , may be now released to the buyers. Any new supplies would have to be according to the new policies of hologram as well as the barcodes. Well organised units like Sula had the system in place last year when the policy was announced. An enquiry reveals that they have enough stocks of Indian wines in the warehouse in Delhi to effect the sales for the current year; duties were duly deposited before 15th February. However, they are in the same boat so far as the imported wines and spirits are concerned, even though the duties may have been paid by the distributor on February 14. The first question I am asked by the producers overseas when I meet them is when the duties are coming down. My answer is pretty much in the public domain- unless the FTA between EU and India is signed during the next few months, we can forget about any relief before the elections. In any case, after it is signed, there is a period of around 1-2 years before it may be implemented. My biggest worry is the excise monster-with every breath the machinery is working overtime how to increase the revenues by increasing excise duties. Unless the GST comes into force, we will always be under the threat of excise duty increases. However, we are clobbered by Indianprocedures which are getting more and more complex by the day-the current deadlock being just one example. At the same time, we have to understand that we are a nascent industry and the government which is manned by people like us, is still in the dark ages about wine and the need to delineate it from liquor which can be a bane of the country, according to a significant number of people, is still there. We have to follow the procedures but protest if they are not well thought out. The current procedure cannot be defaulted for the medium and long term. But the department needs to be tough but pragmatic, not losing sight of the fact that the distributors and the trade are the customers that are paying high taxes towards helping them run the city. It would be in the fitness of things if the department immediately allows the extension of the February 15 deadline to April 1 or May 1, during which period parallel operations may be carried out. This will also allow those who are not in a position to renew the license to exit on April 1. Another rider could be that those who are not ready with the systems may need to pay an additional duty of say 5%, as penalty for not being ready-this being for a few months, say 3-6 months. After this period, everyone would be a part of the system and perhaps the Commissioner would deserve the credit for automating the system and making it as efficient as the Passport procedures. In any case, the excise department would earn our appreciation- on behalf of the importers, distributors and perhaps the on-trade, off-trade and the consumer who would understand the benefits of traceability when it is fully operational. So timely and so exhaustive.Every man in country,involved in wines shall have a solid benefit.An article to be kept for reference. Well really a tough situation for wine producers and importers in the country. If excise dept is so strict about meeting the deadlines then they should perhaps give some kind of monetary support in the form of discounts in installing the equipment and at the same time be strict towards providers of such equipment and software so that they be available to all easily. In all its a very disappointing situation. Thanks very much Subhash, very informative and comprehensive sum-up of the current situtation. Hugely appreciate your inputs.